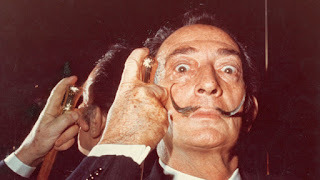 The remains of Salvador Dali are to be exhumed to establish if he is the father of a woman who claims her mother had an affair with the surrealist artist. Dali, who died in 1989, is buried in his museum in the town of Figueres in northeastern Spain. Maria Pilar Abel, a tarot card reader from Girona, says her mother slept with the painter while she was working for the family in the 1950s. Dali was married to his muse, Gala, at the time. A Madrid court said the exhumation was required as there are no other biological or personal remains from which his DNA can be extracted. "What she wants is to have a result of the tests with full guarantee in order to finish with this as soon as possible," Ms Abel's lawyer, Enrique Blanquez, said. If successful, she could use Dali as her surname and pursue further legal action to claim her rights over the artist's work and property, which according to regional laws could amount to 25% of all of the estate. Dali, recognisable by his long, waxed moustache, painted artworks like The Persistence of Memory - famous for its melting clocks - but also made movies, sculpture and adverts. He was known for outrageous behaviour such as giving lectures in an old-fashioned deep-sea diving suit and driving from Spain to Paris in a white Rolls Royce filled with cauliflowers.